Trevor Horn possesses a signature pop savvy and excellence that links disparate musical worlds. The year 2004 marked Trevor Horn's 25th year as a record producer. To celebrate this milestone, Horn gathered an impressive assemblage of musicians whose work he has produced, in a concert for the Prince's Trust at Wembley Arena. Singer/songwriter Seal, the artist with whom Horn has worked most frequently, said that prior to meeting the producer, he was a "fan of Trevor's without even knowing it". Without a doubt, Horn's relatively unassuming public persona makes it easy to forget (or to never recognize in the first place) that he is responsible for such a wide variety of hits across a range of musical tastes. To review the artists whose work Horn has produced -- from the Buggles to Yes to Grace Jones to Seal to Belle & Sebastian -- is to realize the versatility of his craft and the key function he serves in developing the artists' sounds. In the absence of a specific "Trevor Horn touch", he possesses a signature pop savvy and excellence that links disparate musical worlds. 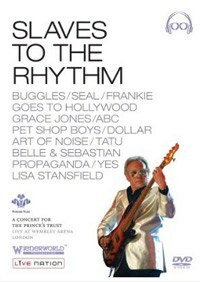 Horn's contributions to pop music are on energetic display in Trevor Horn and Friends: Slaves to the Rhythm, the DVD release of the 2004 anniversary concert. A useful introduction to the producer's discography, the DVD also preserves a significant cultural moment when a lot of these acts, well past the height of their popularity, had one more night to shine. If that sounds clichéd, so well it should. There is, after all, a formula to the tribute/charity concert, and this show fully embraces the formula with a big arena and an overstuffed house band. But despite its adherence to the familiar, Trevor Horn and Friends: Slaves to the Rhythm also incorporates a few considerable elements that add up to something more enjoyable than a generic revue. This one has personality and poignancy, much of which come from the man at the center. Horn is generous and good-natured as he provides a narrative of his career. He is careful to credit his collaborators and shares anecdotes about the artists and songs that appear in the program. Taking a more or less chronological approach (at least in the beginning of the show), the concert presents Horn's early work beginning with the Buggles, for whom he sang and played bass guitar. Horn leads his band in a stellar version of hit "Video Killed the Radio Star", after which he notes that the musicians who recorded the song (all in attendance here) had not played it together since the original studio recording -- a fact that causes the lyric "we hear the playback and it seems so long ago" to sweetly resonate. Horn's performance chops also come to the fore in an imaginative rendition of "Close (To the Edit)" with Art of Noise, a band that gained groundbreaker status because of Horn's early adoption of the Fairlight CMI and the band's use of sampling. There is a tech-geek thrill in seeing the band play the difficult song live, and Horn jokes with the crowd that noticeable mistakes will ensure that this is indeed a live performance. Of the house band members, longtime Horn associate Anne Dudley (keyboards) especially shines on this song. However, despite the expert realization of the number, the crowd does not seem terribly excited to see Art of Noise. Whereas the Pet Shop Boys, whose performance is (by comparison) only average, create a stir just by being there and going through the motions. Also playing a couple of really enjoyable tunes but not thrilling the Wembley audience is Belle & Sebastian, a band Horn says his oldest daughter turned him onto. His work on the band's Dear Catastrophe Waitress is represented here by "I'm a Cuckoo" and "Step Into My Office, Baby". All of the members are in fine form, with Stuart Murdoch and Stevie Jackson both rising to the challenge as they trade off vocals in the huge arena. As if to emphasize the band's "smallness", Jackson becomes a spectator and takes a couple of pictures of the audience before leaving the stage. This gesture at least gets a laugh. Perhaps the lack of enthusiastic reception is a testament to the band's being better fit for smaller venues, though that never stopped Belle & Sebastian from connecting with the crowds at large festivals in the past. Regardless, the performances of these songs translate well on DVD. Although no single artist/band receives a disproportionate amount of attention within the track list, the emotional closing performances could be considered the headliner slots of the show. Seal speaks of the important role Horn has played throughout his entire career, and the producer joins the singer as his live concert bassist for the first time in their long collaboration. Following that minor bit of history making is an epic three-song finale by a reformed Frankie Goes to Hollywood. Blasting through "Welcome to the Pleasuredome", "Two Tribes", and "Relax", the band (with then-freshly drafted singer Ryan Molloy) transplants viewers in attendance and at home to its unstoppable 1984 pop glory. Even strong detractors of the group would likely be won over by energy the band members radiate. They clearly relish another chance at the spotlight, and here Trevor Horn has made it possible. The additional features on the DVD further expand the concert experience. A making-of documentary reveals the process through which the show developed, and a Jukebox facility allows viewers to choose the order in which they want to see the performances. The most enjoyable feature is "Frankie Say Reform", which follows original members of Frankie Goes to Hollywood as they seek a replacement for singer Holly Johnson. Open auditions and selection processes eventually find Molloy to be the best fit for the band, and the weight of his responsibility becomes clear when he says he has only ten days to get ready to perform for a crowd of 10,000 people. To see the high-stakes, behind-the-scenes events that led to the successful performance makes the band's short-lived comeback seem all the more bittersweet in retrospect. In the end, Trevor Horn and Friends: Slaves to the Rhythm serves as a reminder that time has its way with everyone and everything. There is the underdog thrill of past- their-prime musicians having another go at stardom. More sobering, however, is the contrast between the sight of Horn's happy family and wife/label partner Jill celebrating at the concert and the tragic accident that put Jill in a coma less than two years after the concert was filmed. Horn's brand of pop music might not always be taken seriously by those who fancy themselves serious music fans. But the songs he produced are what endure, unchanged, through triumph and tragedy. There exists in them a kind of restorative power that brings artists and fans together across the years, and that is worthy of celebration.